She is beautiful. Thank you for sharing the file. 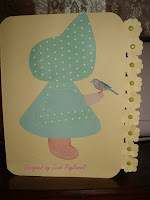 My mother loves Sunbonnet Sue and Friday is her birthday. Guess what I will be cutting tonight?!?!?! Love Sunbonnet Sue. I have a quilt that my Mother made with Sunbonnet Sue's all over the quilt! Thanks for sharing.